Rory McIlroy and Graeme McDowell “hung tough” in the foursomes to help Ireland grab a share of the halfway lead with Australia at the Omega Mission Hills World Cup in China. The Australian pair bogeyed the 15th and 18th for a 70 to fall back into a share of the lead with Ireland on 13 under par, one clear of Scotland’s Stephen Gallacher and Martin Laird (69). Ireland’s 68 matched the best score of the day and with the top 18 countries covered by just five shots, senior partner McDowell insists they must now go on the attack in Saturday’s fourballs if they are to have a chance of taking the title. “Tomorrow is a big day,” McDowell said. “We are going to be in the last group. Fourball is a day to go low and the leaderboard doesn’t mean much until tomorrow evening. Ireland struggled early on before birdies at the fourth, sixth and seventh helped them keep in touch with the Australians. But it wasn’t easy. While they three-putted the 11th and 13th for bogeys, they bounced back each time with birdies at the 12th and 14th and then picked up a shot at the 16th following a huge McIlroy drive. A final hole bogey by the Australian pair allowed Ireland to sleep on a share of the lead and McIlroy was pleased with the result. “I think both of us are very pleased about the score that we ended up shooting today,” said the world No 2. “I think anything in the 60s in the foursomes format is a very reasonable score out there. McDowell added: “It was a good day, a difficult day. Alternate shot is a very difficult format and Rory and I struggled to get into our rhythm early on. “We played the first four holes in one under par and couldn’t have been one shot better than that because Rory made some nice putts. “We hung tough but then we found our game a little bit and all in all four under par is a pretty good return in foursomes we are nicely positions going into the weekend. “We had two bogeys on the back nine and both of them were three putts from awkward enough positions and we bounced back with birdies on the next holes. We were very happy with our strategy today and Rory is probably putting the better of the two of us. “He knocked in a few nice ones today and my iron play was pretty sharp again. All in all very happy. Tomorrow we can go out and be a little more aggressive in the fourball format. McDowell struggled with his putting in Japan last week but he’s happy to see McIlroy stroking the ball nicely on the greens on Mission Hills’ Blackstone Course. Jones and Green were disappointed with their bogey at the 18th but still confident they can challenge for Australia’s first World Cup win since 1989, when Peter Fowler and Wayne Grady clinched theri fourth win at Las Brisas in Spain. McDowell and McIlroy know that the event is still wide open with the likes of Spain’s Miguel Angel Jimenez and Alvaro Quiros just three behind in tie for fourth with New Zealand and the United States. The Spaniards, who have yet to drop a shot, added a 69 to their opening 65 while England’s Justin Rose and Ian Poulter also shot three under to lie four adrift with Mexico and the Netherlands on nine under par. Rumours abound that the World Cup could be scrapped because of the packed international calendar and lack of sponsorship. Top professional golfers don’t have to carry their golf bags but those born in the six counties of Ulster that form part of the United Kingdom try hard to leave the political baggage in the locker room. Flags and symbols are wielded like weapons on a politically divided island and a cocktail of sport and politics is usually explosive. In China today Rory McIlroy and Graeme McDowell produced an explosion of red figures under the tricolour. Graeme McDowell and Rory McIlroy at the OMEGA Mission Hills World Cup, Mission Hills Resort,Hainan Island, China. Picture Phil Inglis www.golffile.ieRory McIlroy and Graeme McDowell opened with a betterball 63 to keep leaders Australia in their sights at the Omega Mission Hills World Cup in China. 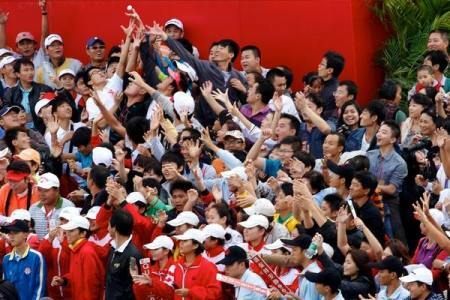 Local fans attempt to catch a ball during the third round of the Omega Mission Hills World Cup. Picture Phil Inglis www.golffile.ieGraeme McDowell was the strongman of the partnership as Ireland fired an eight under par 64 in the fourballs to take a two stroke lead into today’s final round foursomes at the Omega Mission Hills World Cup in China. 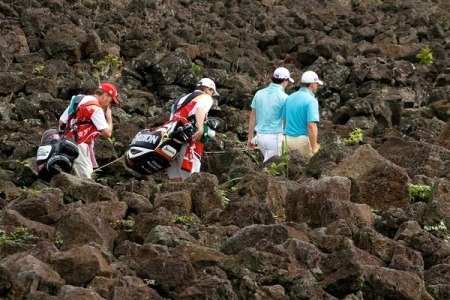 Mission Hills proved to be infertile ground for Rory McIlroy and Graeme McDowell for the second World Cup in a row. Picture Phil Inglis www.golffile.ieIreland’s Graeme McDowell and Rory McIlroy lost their “mojo” and carded a disappointing 72 in the final round of the Omega Mission Hills World Cup to finish three shots behind winners the United States.